Tom Harvey Award for Citizenship - Website of commday! 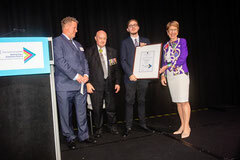 David Harvey (left), Vice President, Australia Youth Trust with recipient Paul Ell, winner of the 2018 Tom Harvey Award and his proud grandparents. The Tom Harvey Award is named after the late inaugural Chairman of the Australia Youth Trust and recognises the outstanding contribution of a young Australian citizen between the age of 15 and 30 years. It comprises a cash prize of $2,000, and is presented at the annual Commonwealth Day Luncheon held at Parliament House, Sydney. Commonwealth Day is celebrated across the Commonwealth of Nations – a voluntary association of 54 member nations, including 1.8 billion people or 30% of the world’s population. the promotion of youth leadership exchange. Tammy Van Wysse (2001) for her marathon swim in support of the Murray-Darling system.